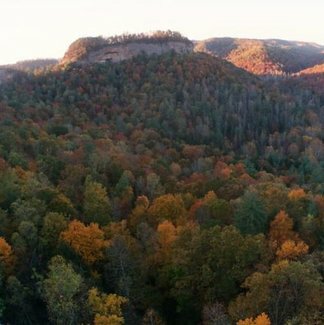 This is the Red River Gorge National Geological Area and Wild and Scenic River. Enjoy ruby flushed sunsets sweeping through hemlocks and fresh rhododendron blooms as you hike through murals of eroded sandstone. Our maps take you there. At a scale of one inch to a quarter mile, our trail map is perfect for backpack camping and craggy, scenic exploration. Grand sandstone arches tower over cool, secluded valleys of rhododendron and hemlock. 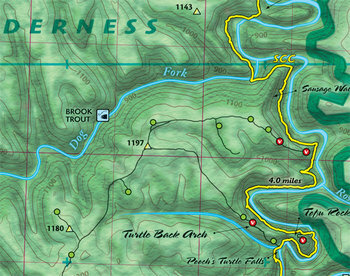 A topographic trail map at 1:15,840 scale with 50-ft contours, GPS grid, elevation profiles, and GPS mapped backcountry trails.